They call me mellow yellow! Believe it or not, this is one of the first 'Mustard' sweaters that I've ever owned in my life. I am not a big fan of yellow and that's mostly because my skin has a yellow undertone so I try not to wear it. I recently saw this balloon sleeved one at Old Navy and HAD to have it! When it finally arrived, I pulled it on and oh man - I LOVED it!! The blonde locks totally embraced the yellow color and made it POP! Click the picture to get your own mustard sweater! The top is called Plush-Knit Balloon-Sleeve Top for Women in the color Tabacco Leaf (click here) and it's originally $24.99 but I know with Black Friday coming up and Old Navy's sales, it will definitely be lowered! The sweater is nice and soft and very warm! It is fairly thin so I wouldn't wear it for winter days just yet. It would look cute with a puffer vest over it - I'm planning on buying this one (click here) fairly soon! 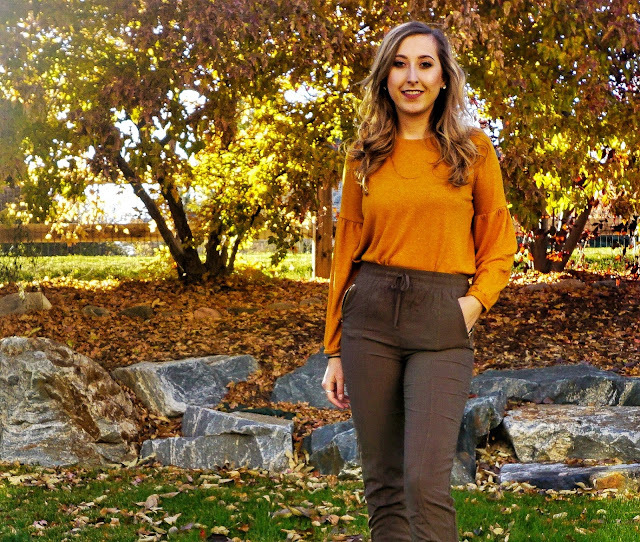 The pants are an olive green color and they are actually from Ross so I don't have a direct link, but I do have a great alternative (click here) Target or click here (Target). The makeup I have on is from my Naked palette, which I did a post here. The lipstick is the Kat Von D lipstick that I have also blogged about here. Click the picture to shop this look!